Funny things happen when you become a dog owner. First, you find yourself taking lots of photos of your dog. See the photo above? It's just one of many photos that I've taken in the last month alone. Seriously. 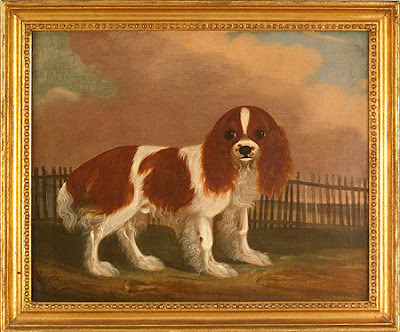 These two 19th c. English paintings of Cavaliers both have provenances listed as "Parish Hadley". Available through William Secord Gallery. I love that the two dogs have feathers and slippers just like Alfie. Alfie's tail, however, is much longer than those above. 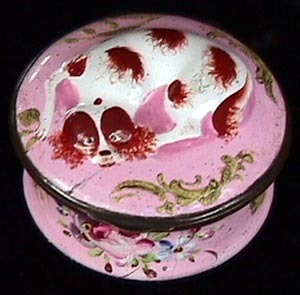 A c. 1860 micromosaic brooch by Castellani. Auctioned at Christie's London in 2006. 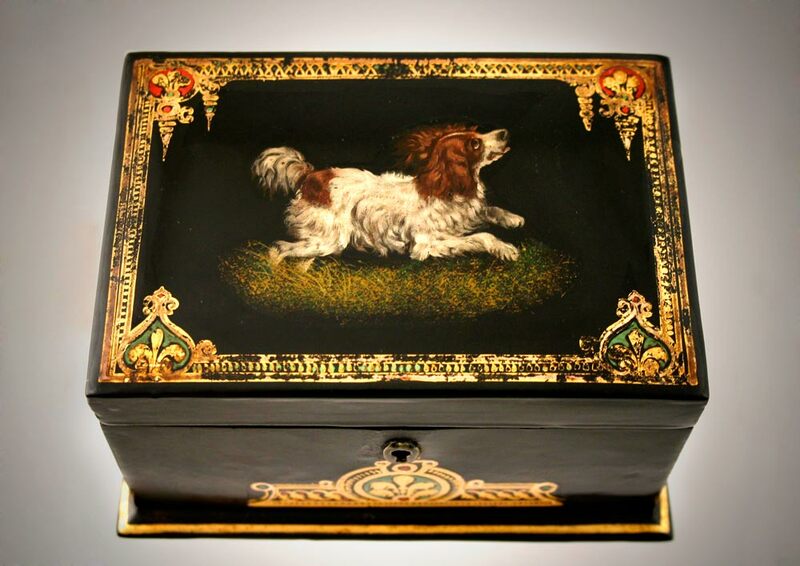 A c. 1890 Tea Caddy made of lacquer and papier mache. Available from Hamshere Gallery. A c. 1780 Snuff Box depicting a King Charles Spaniel. From Taylor B. Williams Enamels. 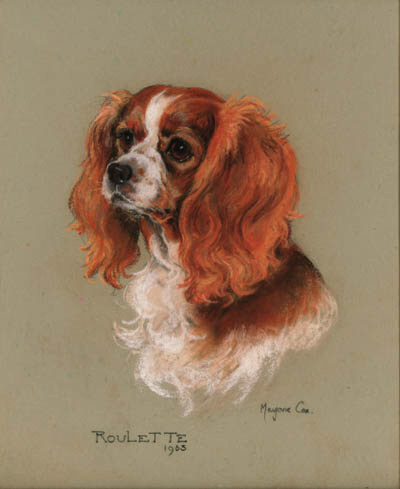 A pastel drawing of "Roulette" by Marjorie Cox, 1963. Sold at Christie's in 1999. Oh you know I love Cavs! I must have thousands of photos of Cholo! And PVE painted his portrait. He is my second one in the last twenty years. 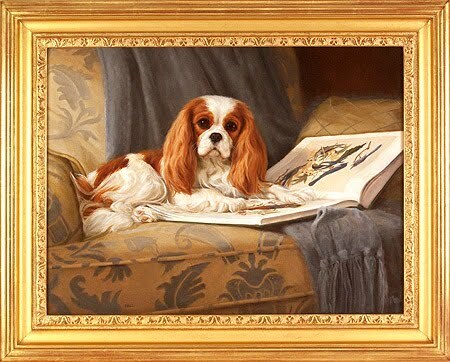 The first time around I collected those sweet English style paintings and needlepoint pillows with a Cav on them, and decorated my whole house in the English style. I also had a Welsh Pembroke Corgi then!!! I was an Anglo maniac. And wait until friends start giving you the Cav stuff too! But the best Cav thing to have is your little baby, who is adorable. PS I am sure you already have a wonderful book from the 1990's called The English Dog At Home. Hi Valorie! So nice to hear from you! Yes, the best Cavs of all are our little pups. I'm not familiar with that book at all, but I'm off to find a copy of it now! 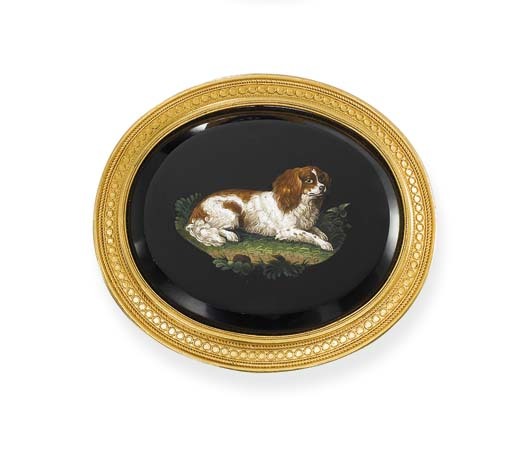 Ah, my family is waiting for our cavalier - three litters are going to come up in Spring and Fall 2013. I am already starting to feel "dog-crazy", just after visiting the breeder of these delightful dogs! We cannot wait for a pup of our own. Your dog is ADORABLE! With those big, soulful eyes, you might think it was a Keene painting! Oh dear, the paintings and drawings looks all so beautiful! 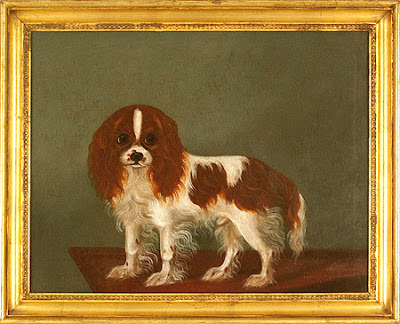 I thought about having painted our Cavalier Ralph once! Now that I see all these paintings, I definitely have to do it!! Greet, My sister painted a portrait of Alfie. I need to take a photo of it! Thanks for the adorable pictures Alfie. His less than pleased about it Christmas photo was so adorable! Have wondered how the all boy little guy was doing in his swell digs! (Translation: how much as he nibbled?) I promised my husband no new dog until he retires (several years), so I'm a bit dog ga ga for others. Especially dogs who have the gorgeous eyes and spunky personality. Believe it or not, Alfie never really chewed up anything. That's not to say that he didn't misbehave in other ways, and he's known to act up every now and then. But then again, what should I expect from a 14 pound wonder who rules the roost?!! And the best to you and Jones as well! I love poodles! Your Alfie is a striking looking little guy - even with the longish tail which I find charming. I hope you run down a copy of The English Dog At Home - you'll love it. I loaned my copy out and you know the rest of the story. I forgot about the book and now it is gone forever. Alfie will completely take over your life in a good way so never think your readers will mind the occasional mentioning of him and "the goods"! I'll pass your greetings on to Alfie! Regarding your book story, that is exactly why there are only two people to whom I loan my books. I just don't trust other people with my books. Sounds harsh, but it's true! I will try to find that dog book, though. My parents have 2 Blenheim sisters called the "little girls" to avoid confusion with my sisters "the girls"-They are absolutely potty about them and the best thing that we could have given them- My Mom has put her foot down "NO BLENHEIM TCHOTKES EVER" My 88 year old Dad talks baby talk to them - something he never did to us that I can remember. Thomas, your mother is a very wise woman! 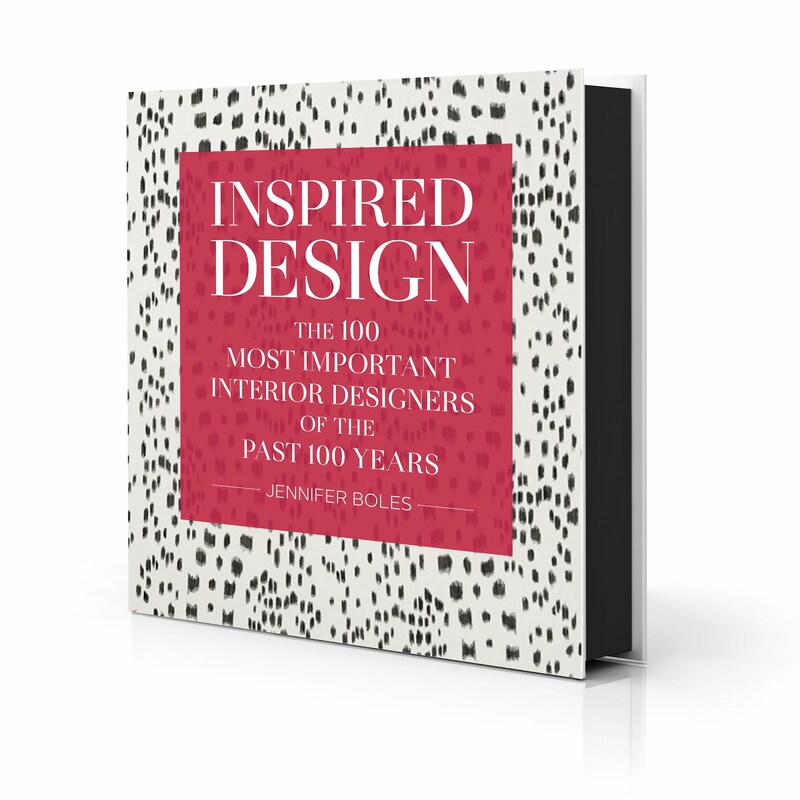 You can't bring even one tchotchke into your home, because others are sure to follow! Yep it's a slippery slope-I starts with fridge magnets and there's nowhere to go but down from that point on. there is another book you will love called 'Living with Dogs' - its the American version of 'An English Dog at Home' with Brooke Astor, Caroline Roehm and everyone else we all love in it. Loved your post today, we can never get enough dog stories ! Yes, a great book Living With Dogs - there is a delightful photos of two Cavailers dressed up as "royalty" in it! Oh congratulations! A pet dog is just happiness itself. I got a poodle 1 year ago and I am over the moon in love with him. He is called Rupert, he's a black toy poodle, he comes to work with me every day and sleeps in a tub of fabric scraps( I'm a dressmaker) I have hundreds of photos of him. He doesn't photograph very well, being so black, he looks like a black fluff ball with no definable head/eyes/backside. I bought him after 7 years of deliberating. I'd read Jaqueline Susann's book "Every night, Josephine!" 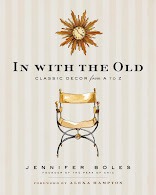 all about her pet standard poodle Josephine, it was a hoot and I was hooked. I'm happy every day when he runs towards me with his bum wiggling and his happy dance. BTW you blog makes me very happy too, it's a lovely escape from the fashion world for me. Rupert sounds adorable! My life wouldn't be nearly as complete without my Alfie!